My son has been laying on his belly and slithering here and there for days so I figured we should channel that energy and throw in a lesson as well. 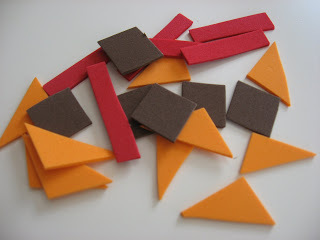 So this activity makes something for my son to push along the floor as well as reinforcing shapes. He was also so excited to use our new paint roller, it’s amazing how something as small as a new paint brush can make art time new again. Gather your materials. 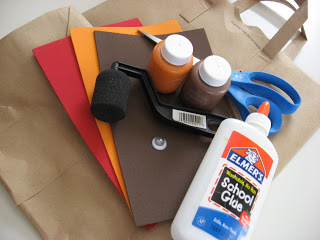 You will need a paper grocery bag or large piece of paper, paint, a brush or roller, 2 googly eyes, some different color foam , a plate for paint, scissors and glue. Cut open the bag so it’s a one long piece and draw a snake. I taped it right to the table. Start by choosing your paint colors, I was itching for my son to pick something bright but he chose brown and orange- and I am so happy he did I think it looks great. 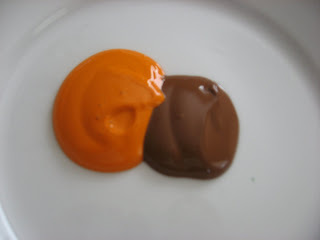 Pour both colors into a plate. 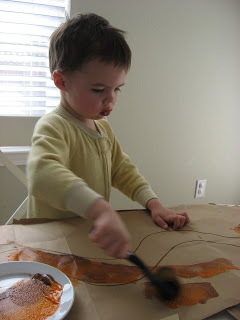 While your child is painting ( or before you start if that works better for you) ask your child what shapes they want to put on the snake, or decide yourself if they are too young. Cut large pieces for little guys that are still mouthing things. We don’t want anyone to choke! Time to glue the pieces on! I put the glue on in dots all along the snake. 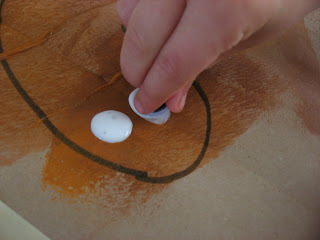 Cover each glue dot with a shape. Older children should be doing a pattern ! 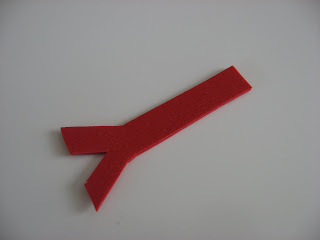 While they are adding the shapes, cut out a tongue from red foam. Add the eyes and tongue. Let dry and cut out! ” Hide and Snake” by Keith Baker is a fantastic book for a wide range of ages. 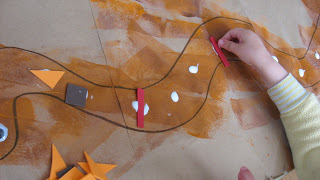 The story follows a snake that hides in multi colored places. 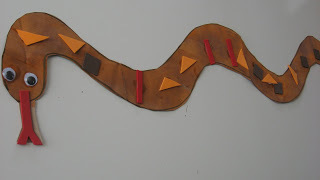 It is not too easy to find the snake , but easy enough that this won’t frustrate your child. With older children this book can open a dialog about camouflage and how snakes use it for protection and hunting. 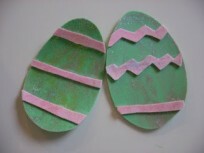 Younger children love books likes these because they can stay “busy” while you read the fun rhyming text. 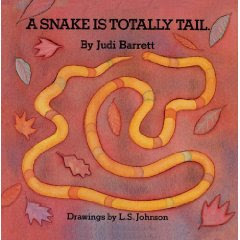 “A Snake Is Totally Tail”by Judi Barrett is a great book for teaching about animals. It doesn’t go into great depth for each animal instead if focuses on the one most obvious attribute of them all. 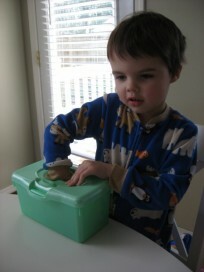 What I love is that for toddlers they are able to see that easily in the pictures as you read the story. It seems simple and sorta average at first but sit down with a child, read it and it’s simple genius is blatantly apparent! 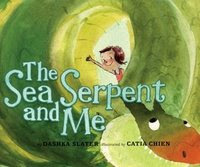 “The Sea Serpent and Me” by Dashka Slater is a sweet dreamy book. A little girl finds a sea serpent in her bath tub and they become friends all the while knowing he belongs in the sea. She promises to take him back but they keep finding reasons to wait. When they do finally go and he returns to the sea you can’t help but get a little lump in your throat remembering all those times you have had to say goodbye even though you didn’t really want to. The illustrations by Catia Chien make the whole book feel like a dream. Next Post: Celebrate With Us! 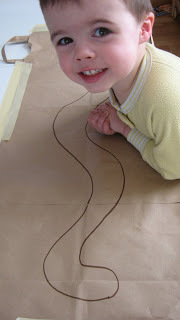 We are so making that snake today! Thanks for always having a smart yet easy craft! 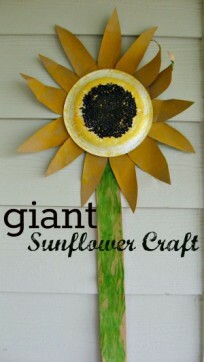 I love your site and I’m so glad I stumbled upon it! I’ve struggled to get my little guy into making crafts. Your ideas are simple and really get him excited. Thanks again! Cool, thanks for the fun snake craft and great books to look for. What a great snake and I loved the painting with a roller. Sometimes I read the wonderful things people do I wonder why I never think of these. I must have brain block–at least that’s what I tell me kids. We love our snake , I am so happy you do too! The roller was a “Stop fussing while I try to find the exact pen I want, I am neurotic and need this specific one- oh look here is a roller, paint the cart while mommy looks” impulse grab. Glad I got it!